Music in Movement (MiM) highlights the richness of European contemporary music by tracing the stories of four eminent composers: Louis Andriessen (NL), Pierre Boulez (FR), Arvo Pärt (EE) and Kazimierz Serocki (PL). Through accessible themes, quizzes and, most importantly, a wealth of music, MiM reaches out to a broad audience in a new and engaging way; by retelling and helping them better understand the stories of four unique individuals. Visit the Music in Movement portal (www.musicinmovement.eu) and discover the works of these eminent music personalities, read their biographies, watch interviews, read music scores, or make use of inspiring teaching resources. The website also offers an innovative presentation form called ‘Musical Crossroads’. 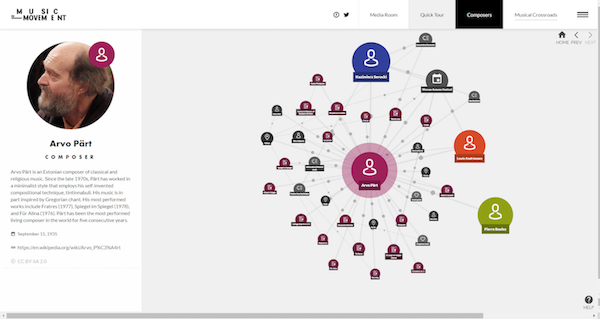 This graph representation offers users new insights and connections between the composers, events, influences using openly available resources and linked data technologies. The MiM project demonstrates the importance of music and sound heritage for European AV archives and their willingness to make it available in an international context. The project is led by four prominent institutes in the domain of preservation and exploitation of cultural heritage: the Netherlands Institute for Sound and Vision, the National Film Archive - Audiovisual Institute, Poland, the French Audiovisual Institute and the Arvo Pärt Centre, Estonia. The project is co-funded by the Dutch Mondriaan Fund.